Inside Dimension: Required Choose Options 2.00" 2.25" 2.50" 2.75" 3.00" 3.25" 3.50" 3.75"
The Partition Wall Furniture Bracket secures file and storage cabinets to partition walls in open-plan office areas without drilling or anchoring to the wall or floor. The cabinet is secured with a special semi-rigid brace that hooks over the partion wall into a sleeve that attaches to the back of the storage or filing cabinet. The fastening sleeve is attached to the cabinet with 3M® VHB adhesive that provides 1200 lbs of shear strength. The optional tek screws help ensure the effectiveness of the adhesive bond. To move an item, simply remove the partition strap out of the rear sleeve and re-attach at its new location. The brace is made of 10 gauge steel and comes in various inside dimensions *(I.D.) to accommodate the partion wall thickness. *The Inside Dimension of bracket is equal to the Outside Dimension of the partition wall. 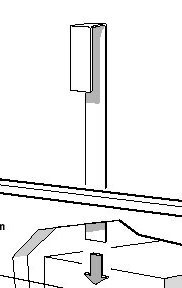 Please select inside dimension of bracket as it applies to your partition wall.